I just finished installing some green technology that pays for itself. Yes, I installed insulation in the ceiling of our house. In my case half of our electrical usage occurs in the months of December, January, and February so adding insulation should have an immediate impact on our electrical bill. In my case I could easily improve the existing insulation(R-15) in the ceiling by laying with a larger insulation blanket(R-30) on top of it. This would get us pretty close to the recommended value for this area of R-49. Installing insulation is a low risk, low reward project that almost any home owner can do. What I mean by low reward is that you will see a slightly lower annual electrical bill. The good news is that you will see these benefits for many years. 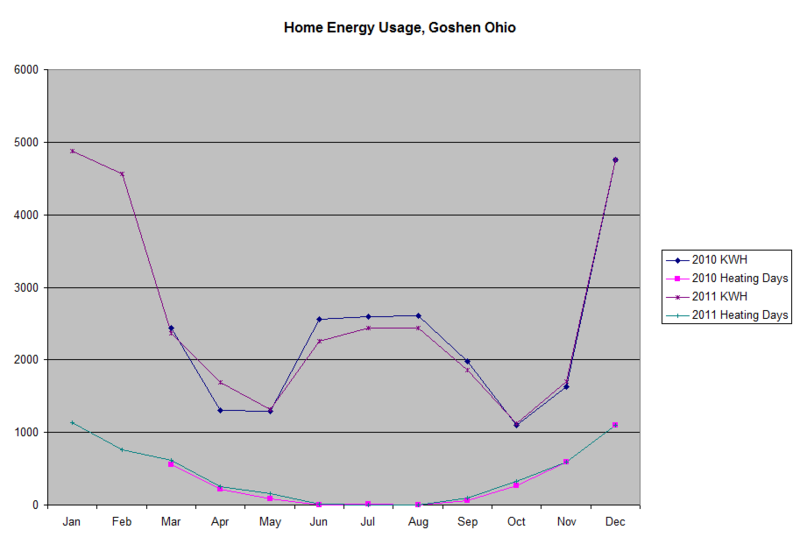 As an example I plotted our energy usage using data off of our bills and heating degree days from http://www.degreedays.net/. I included the degree day data so that I could identify significant differences in weather from one year to the next. From a heating and cooling view, 2010 and 2011 are very similar. Although I am missing my bills from early 2010 and the December bill will not be available for another 30 days we can see the impact of the insulation I installed last spring on my electrical consumption where it dropped between 150 to 300 KW-Hours. This amounts to only a $14 to $29 drop in the monthly electrical bill. Its not much but every little bit counts.